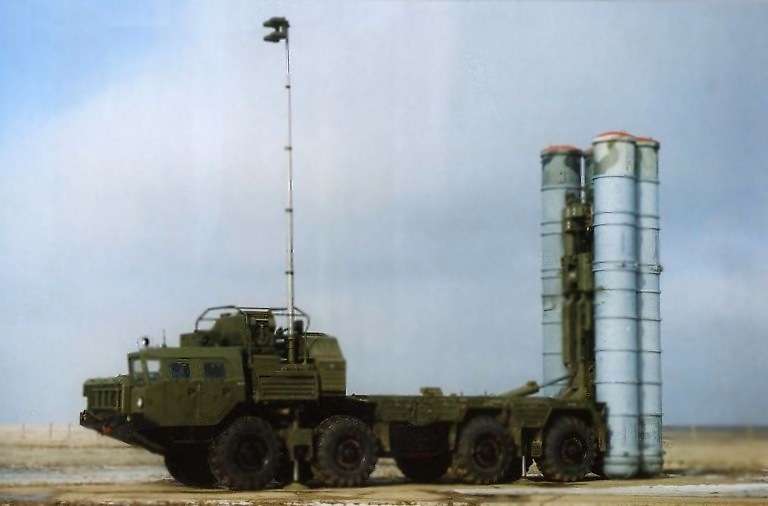 The Almaz S-400 Triumf or SA-21 system is the most recent evolution of the S-300P family of SAM systems, initially trialled in 1999. 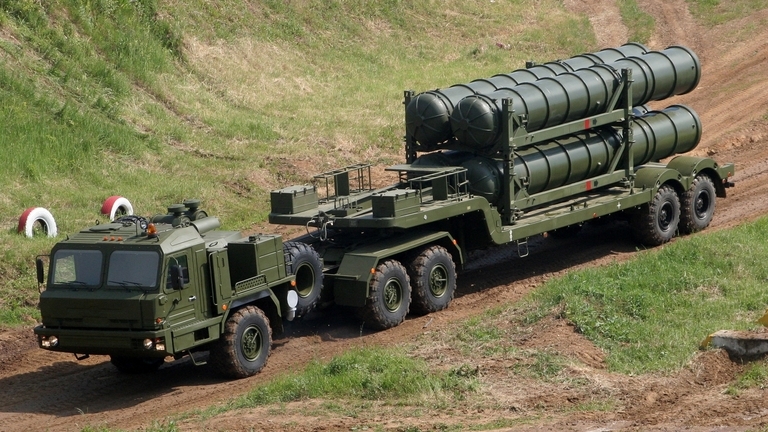 The label S-400 is essentially marketing, since the system was previously reported under the speculative label of S-300PMU3. At least one report claims that funding for the development of the Triumf was provided in part by the PLA. 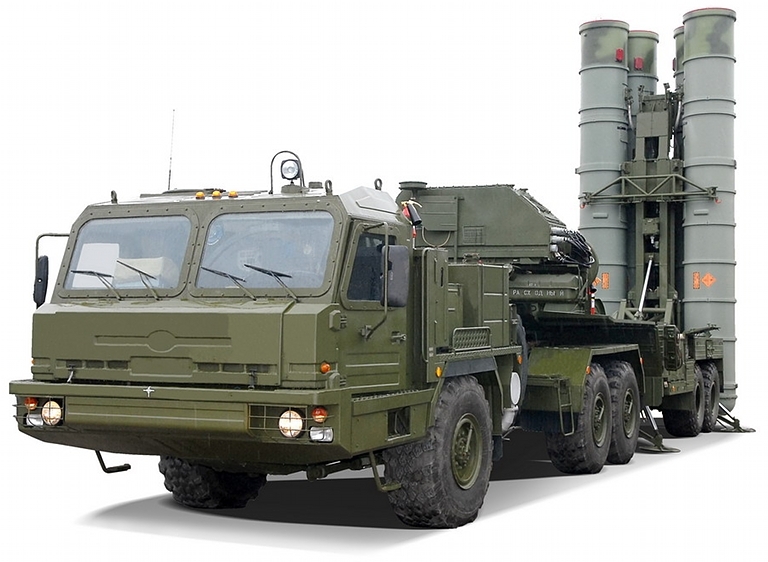 The principal distinctions between the S-400 and its predecessor lie in further refinements to the radars and software, and the addition of four new missile types in addition to the legacy 48N6E/48N6E2 used in the S-300PMU2 Favorit. 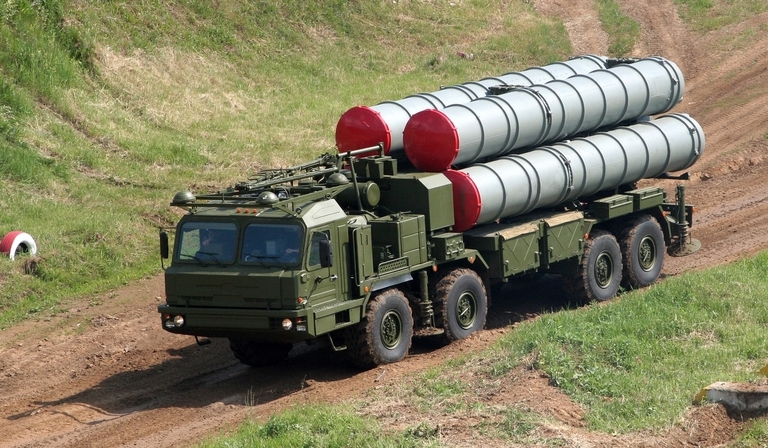 As a result an S-400 battery could be armed with arbitrary mixes of these weapons to optimise its capability for a specific threat environment. The 30N6E2 further evolved into the more capable 92N6E Grave Stone, carried by a new 8 x 8 MZKT-7930 vehicle. The additional range required a significantly uprated transmitter tube to provide the higher power-aperture performance needed, in additional to an improved exciter and automatic frequency hopping capability. 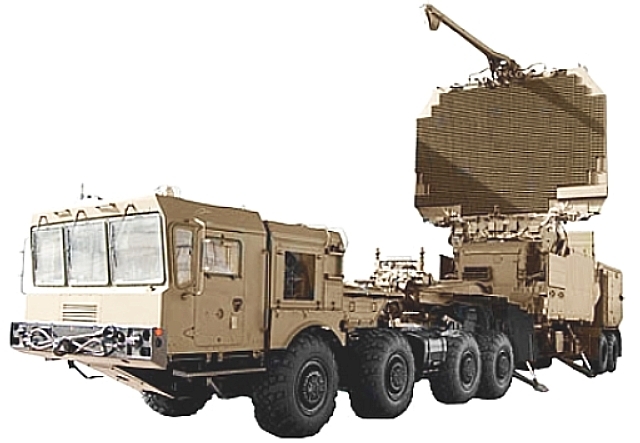 The 96L6 is offered as an 'all altitude' battery acquisition radar, also carried by a 8 x 8 MZKT-7930 vehicle. A new 3D phased array acquisition radar is employed, the 91N6E derived from the 64N6E2, and the 40V6M/MD mast is an available option. 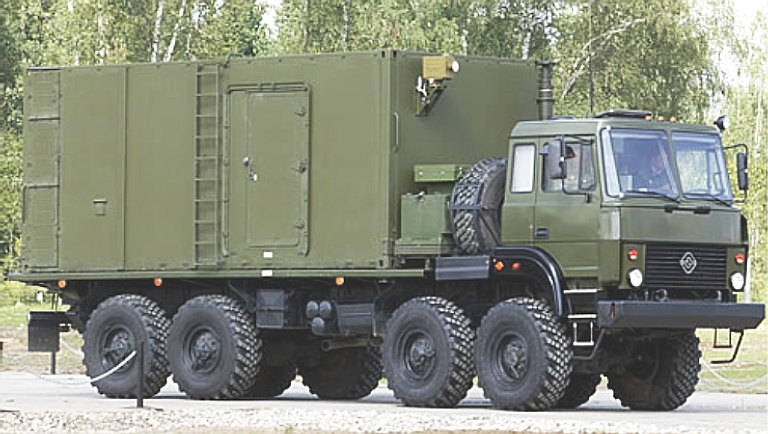 The 55K6E command post is employed, carried by an 8 x 8 Ural 532361 truck. 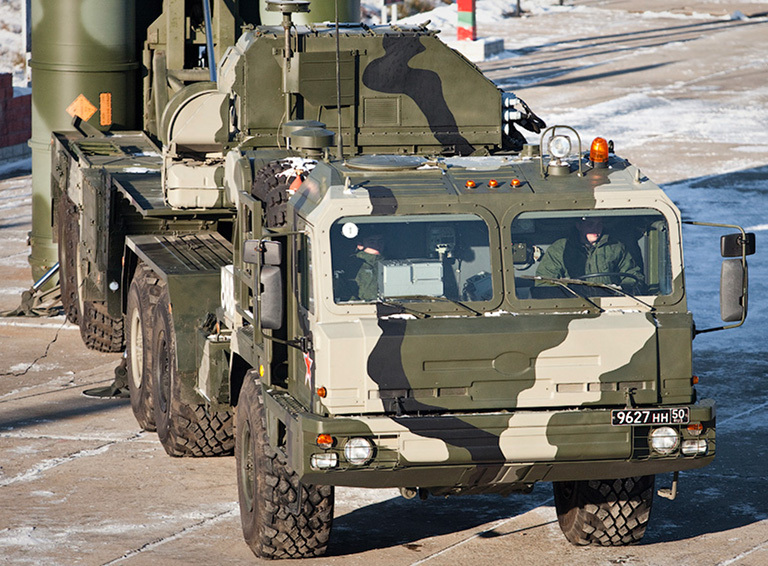 Optional acquisition radars cited for the S-400 include the 59N6 Protivnik GE and 67N6 Gamma DE in the L-band, but also the 1L119 Nebo SVU in the VHF band, and the multiband Nebo M. The Nebo SVU/M have a claimed capability against stealth aircraft. 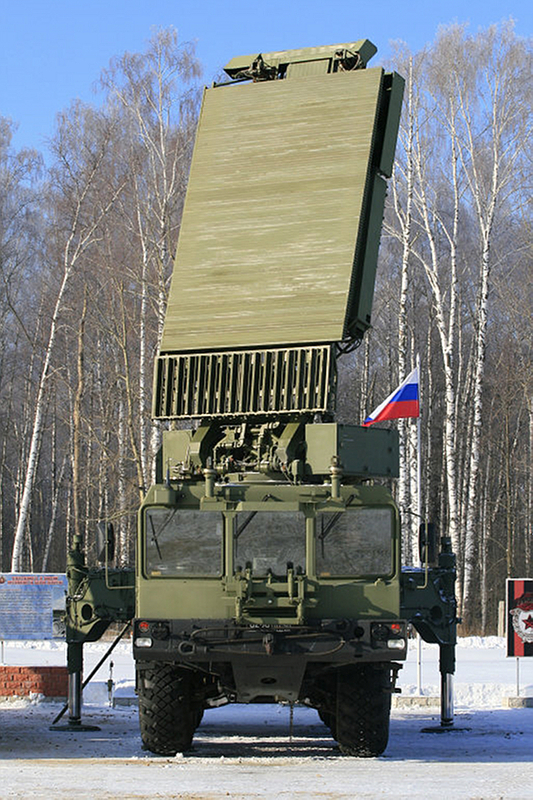 In addition to further acquisition radar types, the S-400 has been trialled with the Topaz Kolchuga M, KRTP-91 Tamara / Trash Can, and 85V6 Orion / Vega emitter locating systems, the aim being to engage emitting targets without emitting from the acquisition radars, or if the acquisition radars have been jammed. 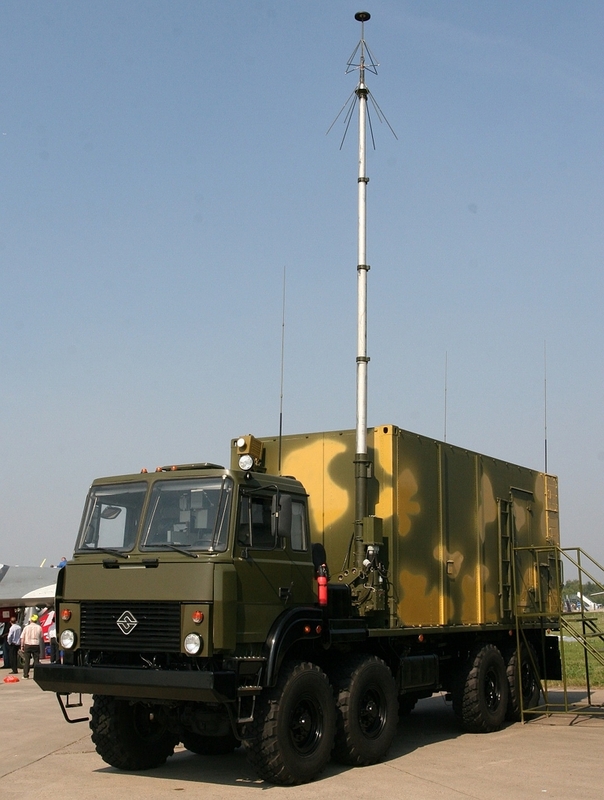 In June, 2008, the manufacturer disclosed the integration of the 1RL220VE, 1L222 and 86V6 Orion emitter locating systems with the S-400. 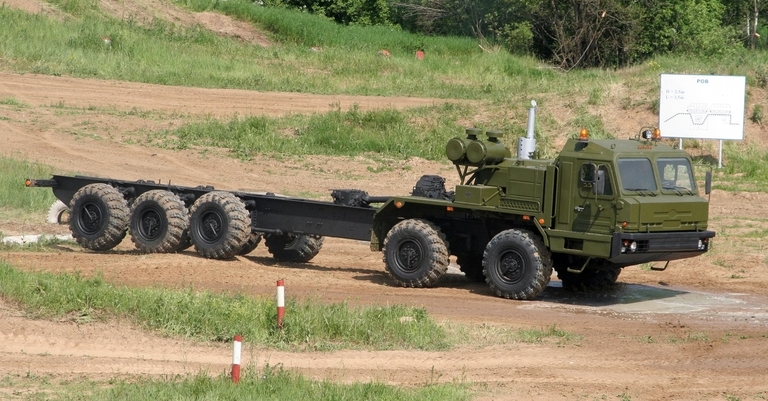 TEL options include the baseline 5P85TE2 semitrailer, towed by a 6 x 6 BAZ-64022, the improved 5P90S self-propelled TEL hosted on the BAZ-6909-022 and intended to carry a heavier missile payload than the legacy MAZ-79100 series TELs, and a new heavyweight towed TEL to be designated the 5P90TMU. 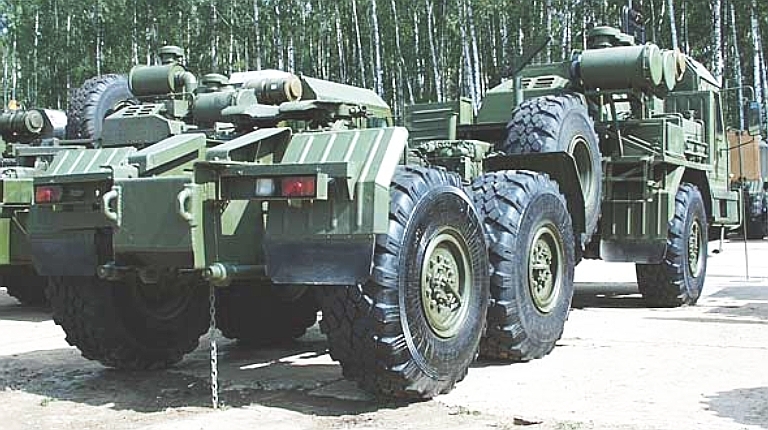 Long term planning is to host all S-400 battery components on BAZ Voschina series vehicles, with the 92N6 Grave Stone and 96L6-1 carried on the 10 x 10 BAZ-69096 chassis, and a new BAZ-6403.01 8 x 8 tractor is to be used to tow the 91N6 Big Bird battle management radar, and 40V6M/T series mobile mast systems. 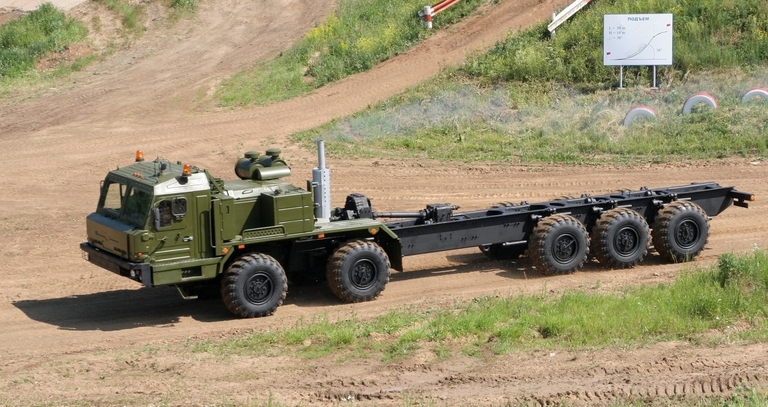 The 55K6E battery command post will be hosted on the BAZ-69092-012 6 x 6 chassis, a flatbed variant of which will be used to tow the 63T6A power converter and 5I57A power generator. 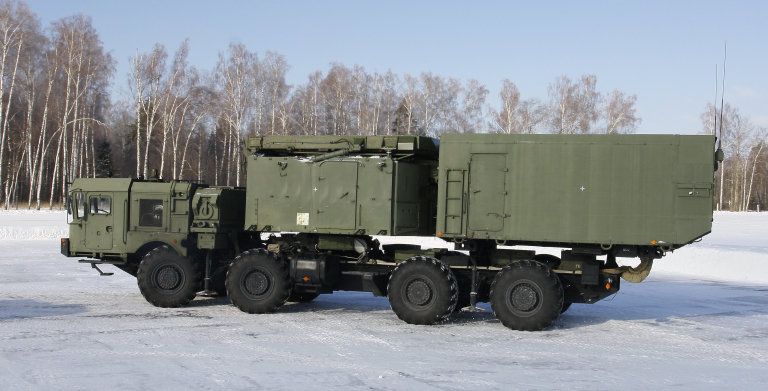 The 8 x 8 BAZ-69096 chassis is also intended for future use in the 96K6 Pantsir S1 / SA-22 SPAAGM. 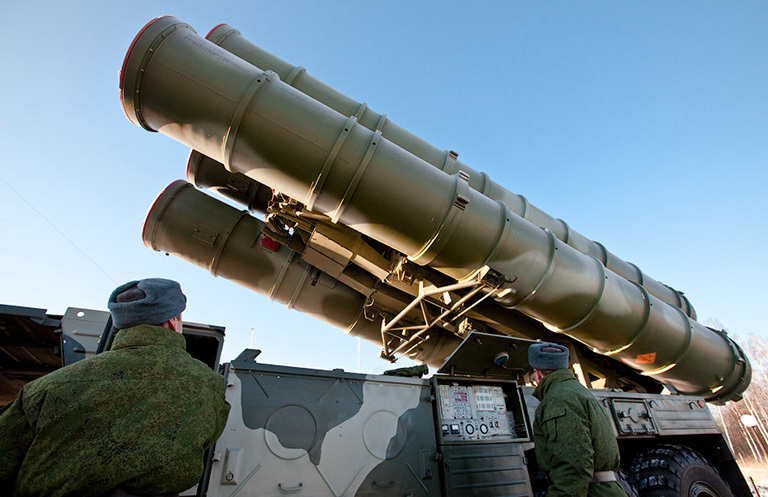 The most detailed technical paper to date covering the S-400 was produced by Dr Alexander Lemanskiy, Chief Engineer on the S-400, Igor Ashurbeili, General Director, and Nikolai Nenartovich, Chief Engineer, of Almaz-Antey, published in the Russian language Vozdushno-Kosmicheskaya Oborona journal, No.3 (40), 20081. 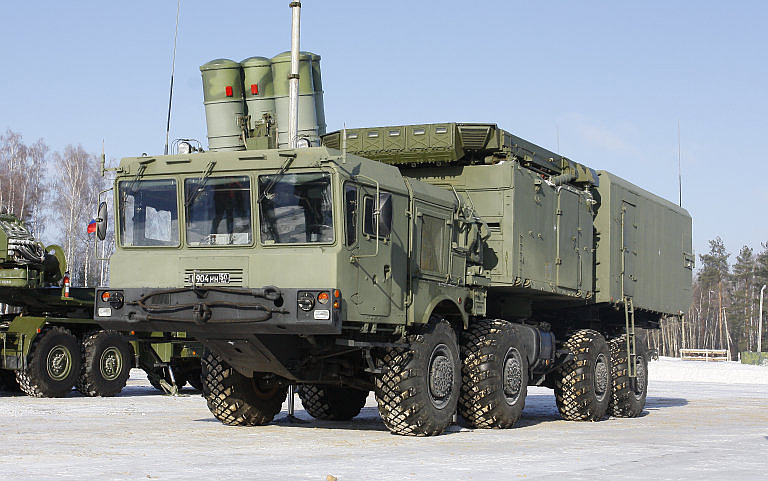 Unfortunately it lacks the detail of later Almaz-Antey disclosures on the S-300PMU2 Favorit, but does provide a good discussion of the rationale behind the S-400 design design, and its key design features. Accommodating an environment where an increasing number of nations are deploying TBMs and IRBMs. 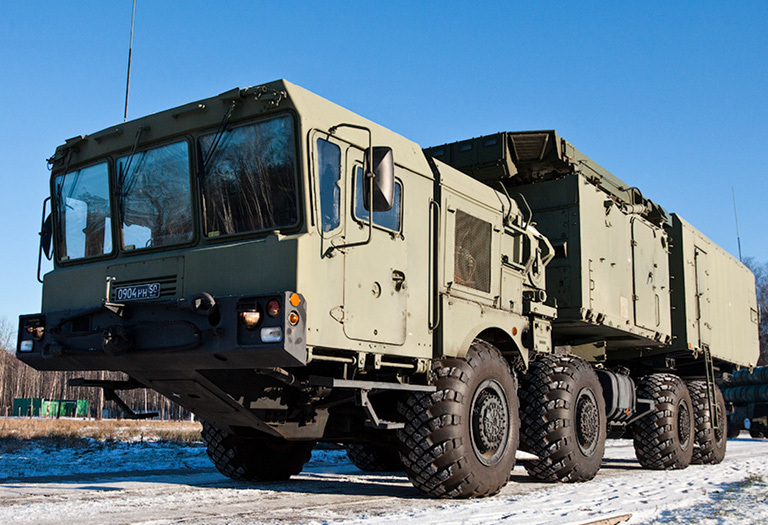 There imperatives were applied to the design of configurations for the Russian Armed Forces and for export clients. 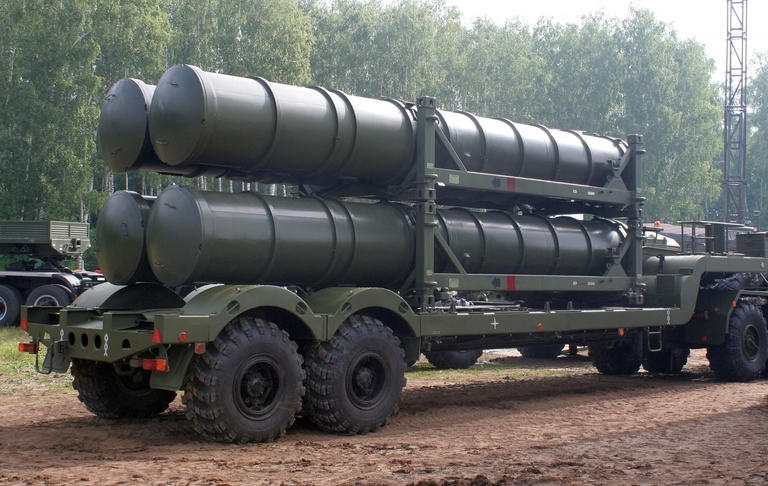 Export variants of the S-400 Triumf are intended to destroy opposing stand-off jammer aircraft, AWACS/AEW&C aircraft, reconnaissance and armed reconnaissance aircraft, cruise missile armed strategic bombers, cruise missiles, Tactical, Theatre and Intermediate Range Ballistic Missiles, and any other atmospheric threats, all in an intensive Electronic Counter Measures environment. 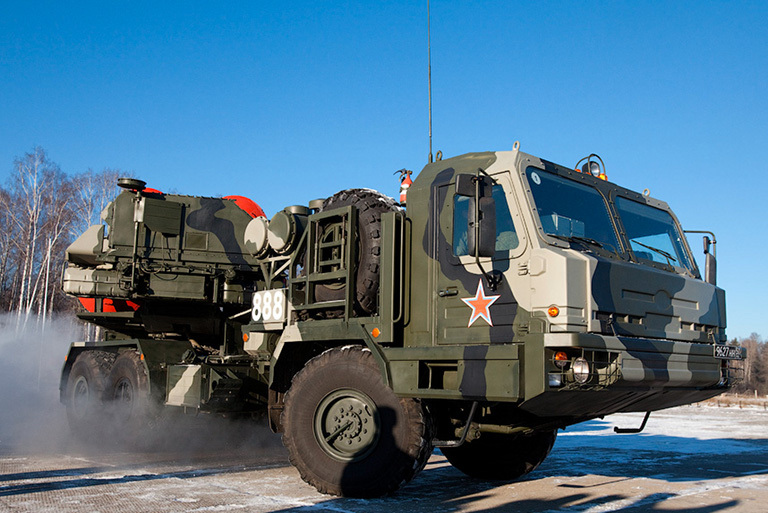 The 30Ts6E logistical support system, comprising missile storage, test and maintenance equipments. 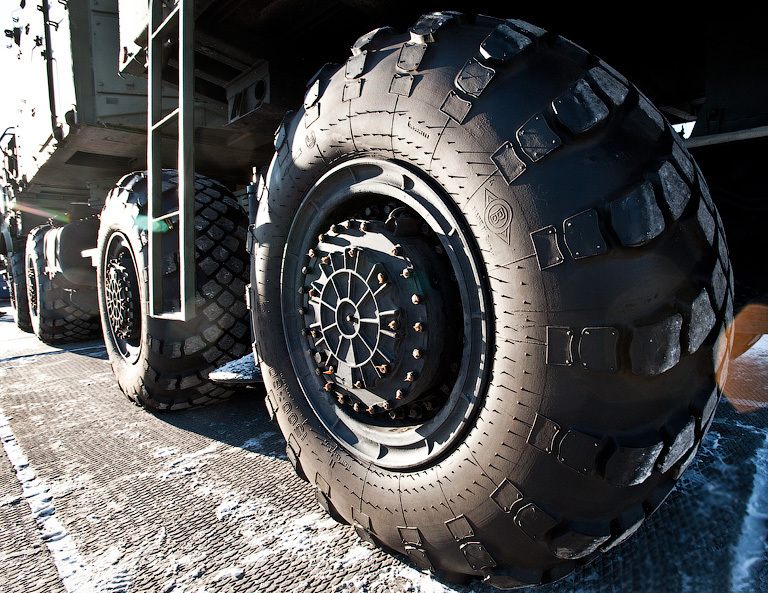 All system components are carried by self-propelled wheeled all-terrain chassis, and have autonomous power supplies, navigation and geo-location systems, communications and life support equipment. Mains power grid converters are installed for fixed site operations. The design permits all equipment vans to be separated from the vehicle chassis for installation and operation in hardened shelters. The communications and networking systems are designed with interfaces for operation over radio-frequency, and landline links, including analogue telephone cables. The 98Zh6E Fire Units can be located up to 100 km from the 55K6E Command Post. The 91N6E Grave Stone can be installed on the 40V6MR mobile mast system for operation in complex or heavily forested terrain. 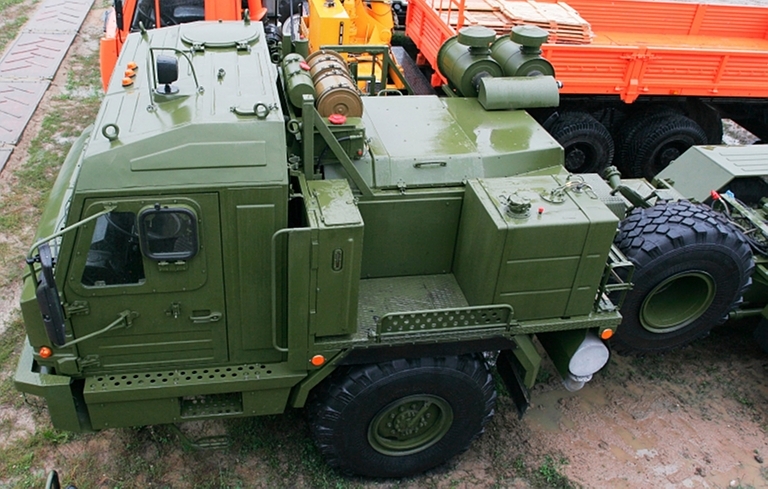 96K6 Pantsir S1 SPAAGM via the lead battery vehicle or battery ADCP where used. In addition software development was under way to provide the capability to network pairs of 30K6E battle management systems. 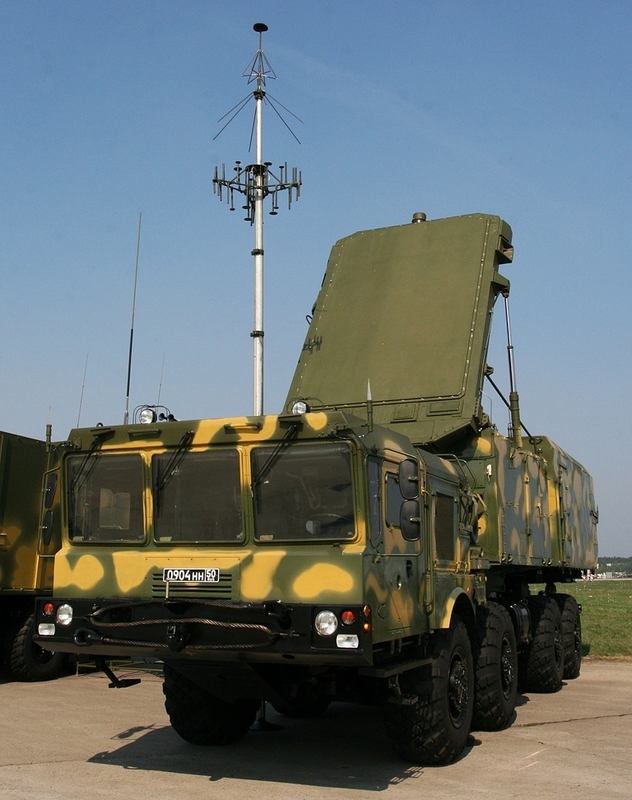 For export clientele, Almaz-Antey offer integration with arbitrary new or legacy non-Russian IADS components. The 55K6E is employed to control all components in the group of batteries, and can collect and present status information from all components. It can also control the operating modes of the 91N6E Big Bird acquisition and battle management radar, including its IFF/SSR functions. 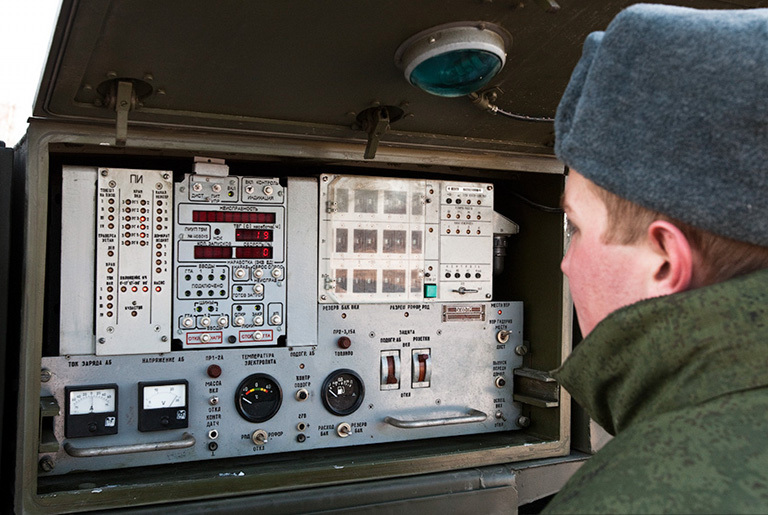 A comprehensive C3 /datalink package is installed, and an Elbrus-90 mikro central processor is used to execute the dataprocessing and system management code. 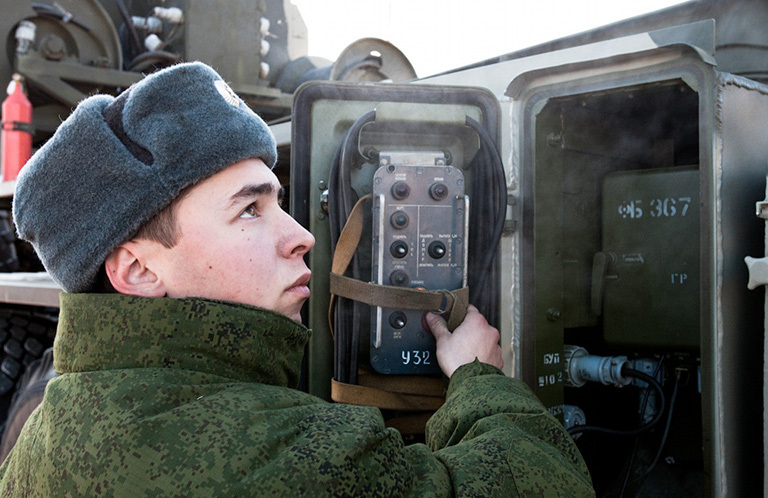 Sharing hardware with the S-300PMU2 54K6E 2 CP, the 55K6E uses 18 inch LCD panels for all crew stations. 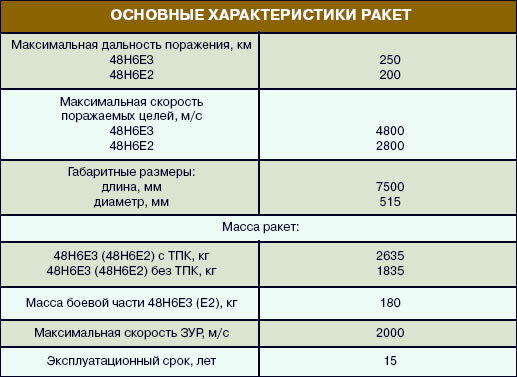 While Lemanskiy et al did not detail the 55K6E any further, the high level of commonality suggests that more recent Almaz-Antey disclosures on the 54K6E2 CP also apply to the 55K6E2. The design changes to the 91N6E were not detailed by Lemanskiy et al, other than to disclose its intended ABM acquisition role. The radar is tasked with acquiring and tracking aerial and ballistic targets, identifying targets, and performing angle measurements on standoff jamming aircraft. The 91N6E is a Janus-faced symmetrical transmissive space fed passive phased array, with a range of conventional circular scan modes, and a number of fixed sector scan modes, using electronic beam steering in elevation and azimuth. In the latter modes, the antenna boresight can be mechanically tilted upward to extend achievable electronic beamsteering elevation coverage. 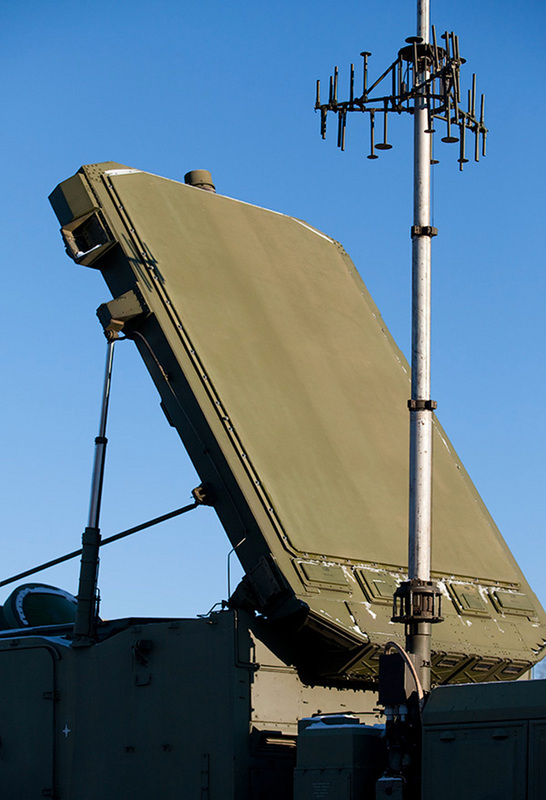 The radar is a pulse-to-pulse agile frequency hopper, to maximise countermeasures resistance. Unique high duty cycle transmit waveforms are available for fixed sector electronically beamsteered search modes. The individual fire units in the battery are designated the 98Zh6E, and comprise a single 92N6E Grave Stone multirole engagement radar and a group of subordinate TELs. The 92N6 Grave Stone multimode engagement radar is a significant redesign of the Flap Lid / Tomb Stone series with fully digital processing and increased power-aperture performance (image © Miroslav Gyűrösi). The 92N6E departs from the specialised engagement and fire control functionality of earlier radars in the Flap Lid family, exploiting abundant computing power no differently than Western AESAs. It is intended to provide autonomous manual and automatic sector searchs, target acquisition and tracking, in adverse weather, Electronic Counter Measures, chaff and low altitude clutter environments. 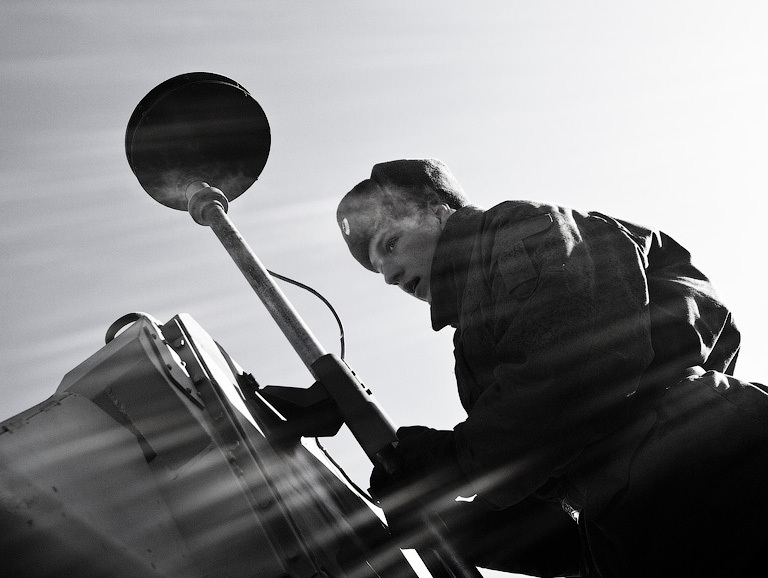 The radar is equipped with an IFF capability. The 92N6E Grave Stone will automatically prioritise targets, compute Launch Acceptable Regions for missile launches, launch missiles, capture missiles, and provide midcourse guidance commands to missiles while tracking the target and missile. 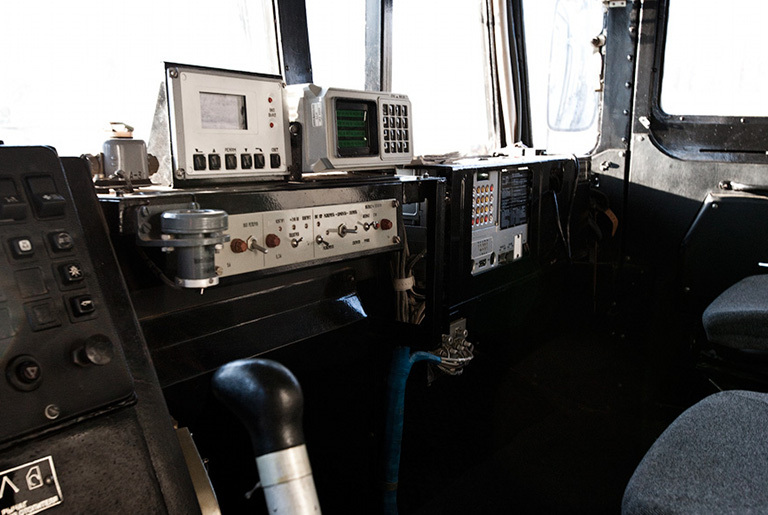 Missile guidance modes include pure command link, semi-active homing, and Track via Missile (TVM) / Seeker Aided Ground Guidance (SAGG), where missile semi-active seeker outputs are downlinked to the Grave Stone to support the computation of missile uplink steering commands. The radar can track 100 targets in Track While Scan mode, and perform precision tracking of six targets concurrently for missile engagements. data exchanges between the 92N6E Grave Stone and 30K6E battle management system are fully automatic. Defeat of high power active noise jammers by the use of “radical measures” in the design. New Electronic Counter Counter Measures technology was employed in the design of the 92N6E Grave Stone, but was neither described nor named. Lemanskiy et al described the 48N6E3 missile in some detail, but did not include any disclosures beyond what is already public knowledge. 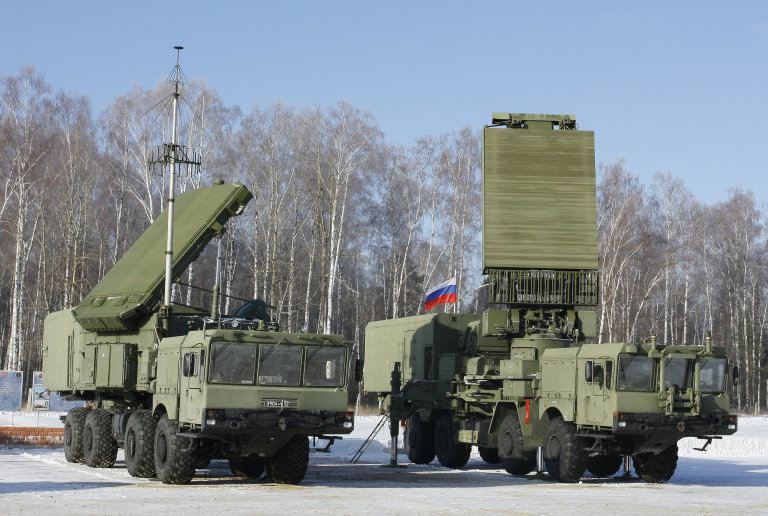 The authors did state that increased radar power-aperture product performance in both the 92N6E Grave Stone and 91N6E Big Bird increases the capability of the S-400 Triumf to engage low signature or stealth targets, but their cryptic claim of 50 percent of the engagement range remains difficult to interpret. 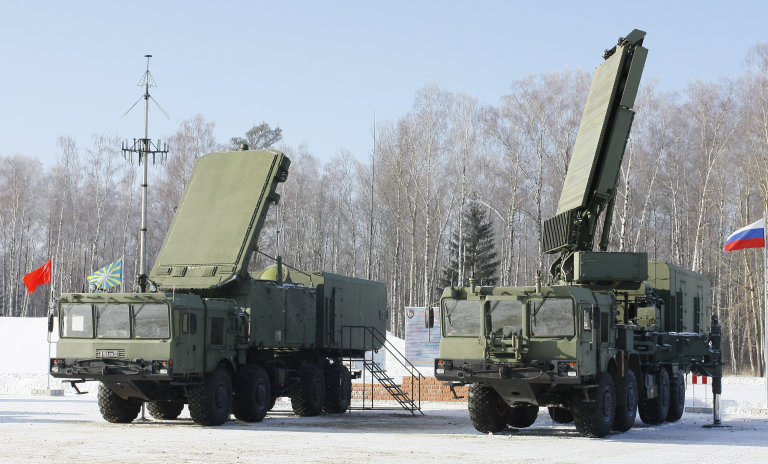 What is evident is that the fully digital S-400 Triumf displays most if not all of the typical capability gains seen in the latest generation of fully digital systems of Western design. The first missile added to the system is the 48N6E3/48N6DM (Dal'naya - long range), an incrementally improved 48N6E2 variant with a range of 130 nautical miles. It is deployed using the standard TEL, the 5P85TE2/SE2. 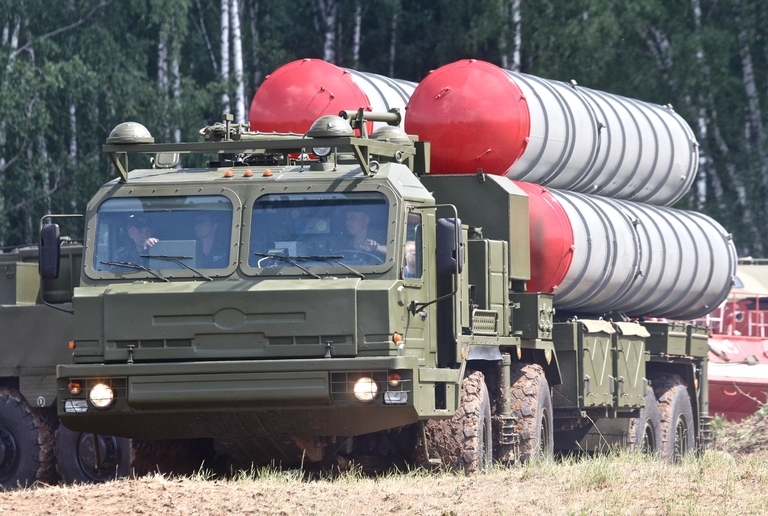 The second missile added to the S-400 is the new 40N6, a long range weapon with a cited range of 215 nautical miles, equipped with an active and semi-active homing seeker, intended to kill AWACS, JSTARS and other high value assets, such as EA-6B/EA-18G support jammers. Further details of this weapon remain to be disclosed. The range improvement to around twice that of the 48N6E2 suggests a two stage weapon, or a much larger motor casing with a larger propellant load. Russian media reports citing PVO senior officers in 2010 indicated that 40N6 range may be a great as 240 nautical miles, and the missile completed State Trials (Russian OpEval) in 2010, and was to enter production. To date no images of the 40N6 missile, launcher container or TEL have been made public. The third and fourth missiles are in effect equivalents to the ERINT/PAC-3 interceptor missile recently introduced to supplement the MIM-104 in Patriot batteries, but designed to also engage low and medium altitude aerial targets. These are the 9M96E and 9M96E2, largely identical with the latter version fitted with a larger powerplant. Fakel claim the 96M6E has a range of 21.6 nautical miles, and the 9M96E2 64.8 nautical miles, with altitude capabilities from 15 ft AGL up to 66 kft and 100 kft respectively. The 9M96 missiles are “hittiles” designed for direct impact, and use canards and thrusters to achieve extremely high G and angular rate capability throughout the engagement envelope. An inertial package is used with a datalink from the 30N6E2/92N6E radar for midcourse guidance, with a radar homing seeker of an undisclosed type. The small 53 lb (24 kg) blast fragmentation warhead is designed to produce an controlled fragment pattern, using multiple initiators to shape the detonation wave through the explosive. A smart radio fuse is used to control the warhead timing and pattern. It is in effect a steerable shaped charge. Source: Bolotov and Mizrokhi, 2003. Both missiles use nose mounted canard control surfaces to effect a high turn rate at altitudes where air density permits the generation of high control forces. Fakel designers Bolotov and Mizrokhi cite 60G capability at sea level, and 20G at 30,000 metres, the latter using thruster control. This is required to effect a “hit-to-kill” endgame against ballistic and high speed aerial targets. While the larger 9M96E2 is an almost direct equivalent in size and performance to the ERINT/PAC-3 round, its control arrangement is fundamentally different, both aerodynamically and in thruster arrangement. The 9M96E/E2 radial thruster package is located at the fuselage CoG, to generate a direct force to turn the missile, rather than producing a pitch/yaw moment to use body lift to turn, as is the case in the ERINT/PAC-3 design. The sleeve mounted tail surfaces are mechanically decoupled from the fuselage in roll, to minimise thruster induced rolling moments. 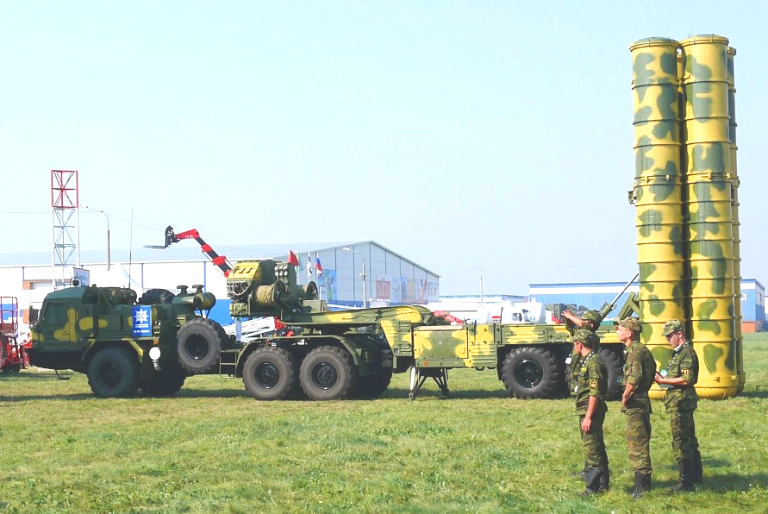 The addition of the 9M96E/E2 missiles, which amount to a combined ABM and point defence weapon designs, is part of a broader Russian strategy of deploying air defence weapons capable of defeating PGM attacks, including the AGM-88 HARM family, and follow-on defence suppression weapons, the latter types intended to disable the S-400 battery acquisition and engagement radars. 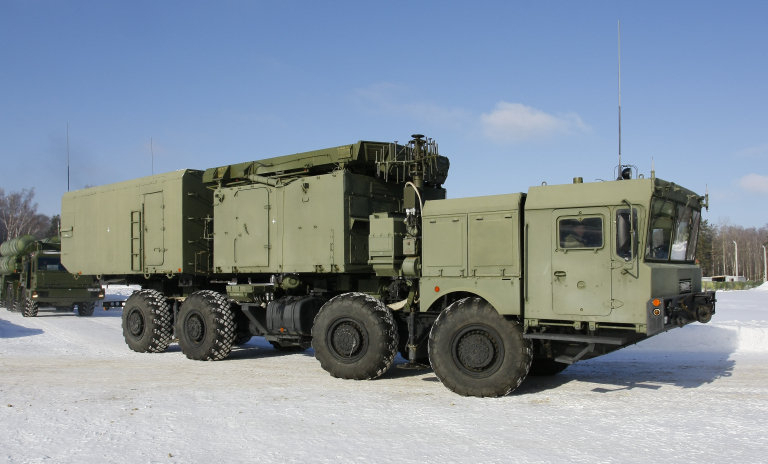 The advantage in using the 9M96E/E2 for this purpose is that it avoids the additional technical and operational complexity of directing other “counter-PGM” point defence weapons such as the Tor M1/M2, Tunguska M and Pantsir S/S1 series. 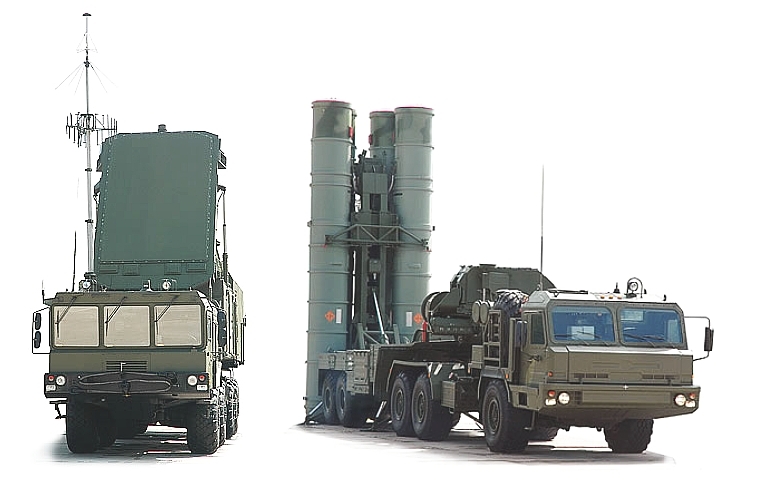 Some sources have credited the 9M96E/9M96E2 missiles to the S-300PMU1 and S-300PMU2 Favorit, which appears to have been the demonstration platform for prototypes of these missiles. Integration of these missiles on either of these systems will not present any challenges, due to backward compatibility in TELs and the use of a datalink supported active radar terminal seeker. To date there have been no disclosures on domestic production or export sales of the 9M96 series. 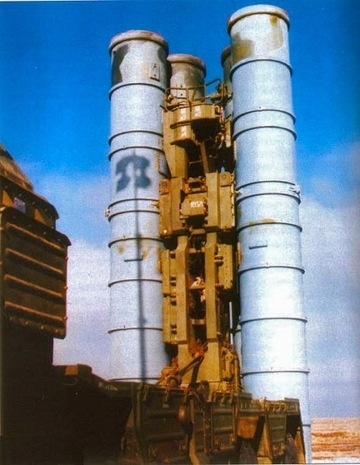 Russia media reports in 2010 indicated that production may soon commence for use on S-400 systems, using a new four chamber launcher/container design with an identical form factor to the standard 48N6 design. 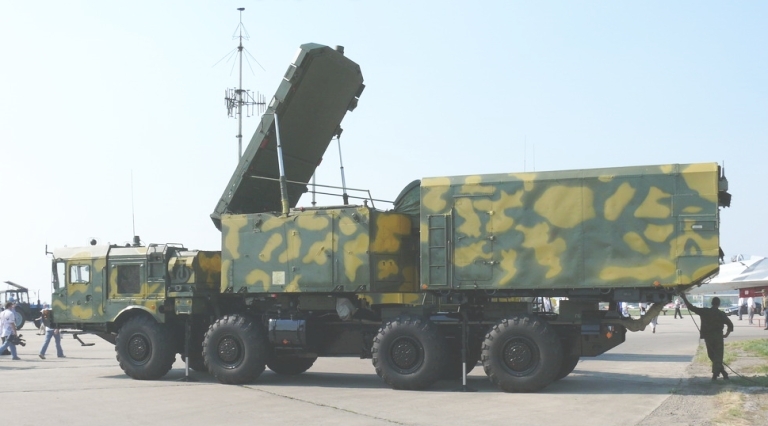 S-400 5P85SE demonstrator TEL with quad 9M96E launch tubes. This design may be replaced in production with a four chamber design in the same form factor as the 48N6 launch tube (image © Miroslav Gyűrösi). 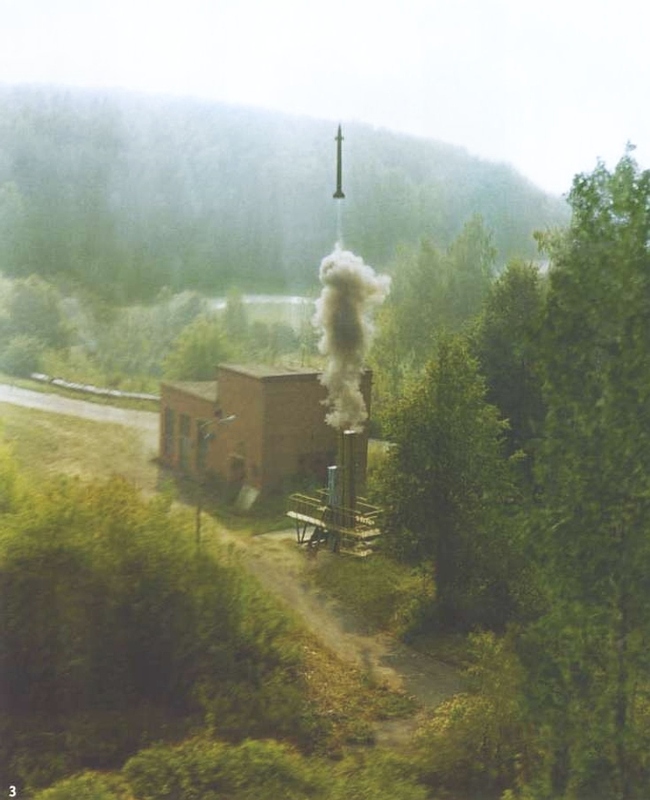 9M96E series missile test launch (Fakel). 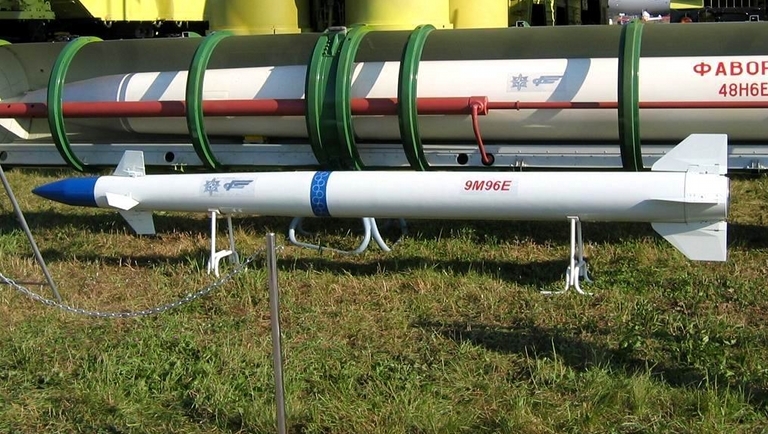 9M96E missile at MAKS 2005 (© 2005, Said Aminov). 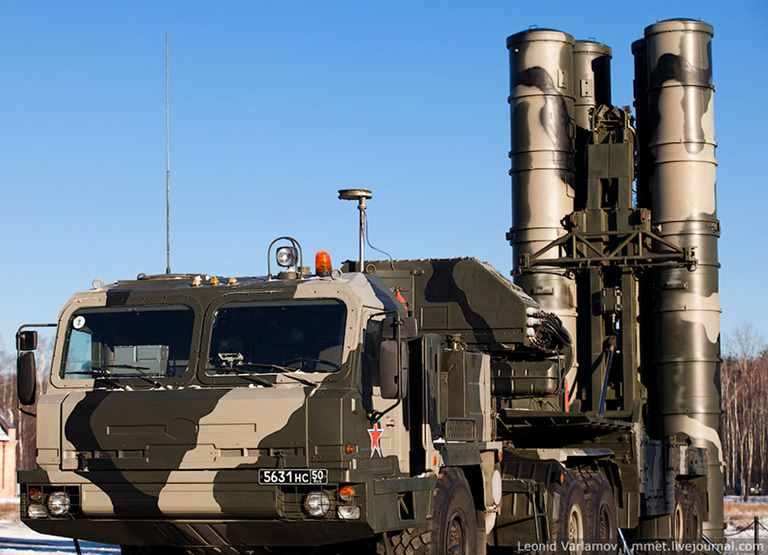 Some sources also credit the S-400 with the capability first demonstrated in the S-300PMU2 Favorit, of controlling S-200/SA-5 Gammon batteries and directing the 5N62VE Square Pair FMCW guidance and illumination radar. 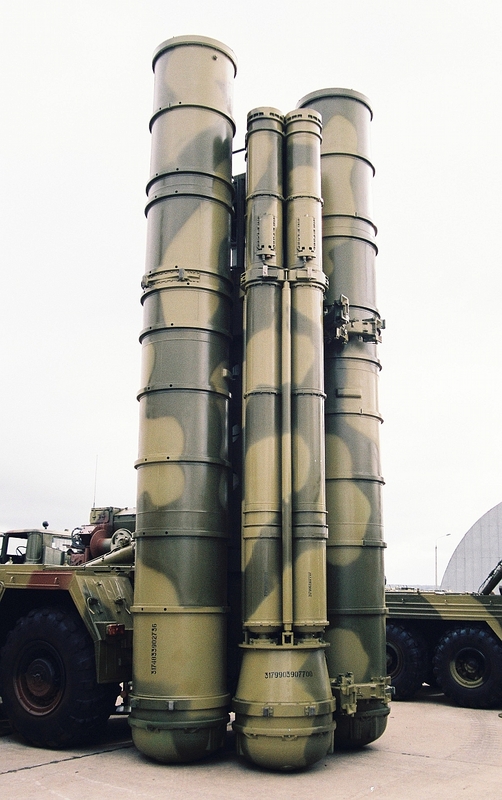 Given that the Russian S-200 inventory and missile warstock has been decommissioned and exported, if this capability is retained, it is for export clientele. 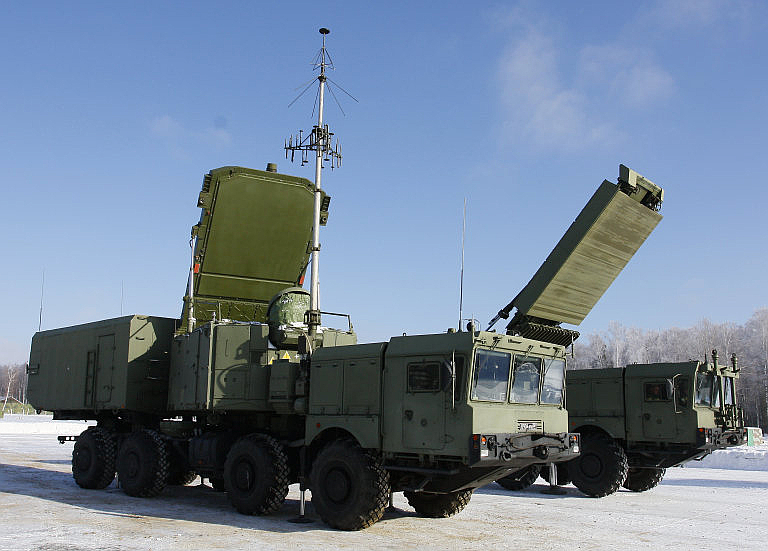 If software and datalink modems are supplied in production S-400 systems to support the S-200 / SA-5, this raises the question of potential hybridisation with other legacy SAM types. 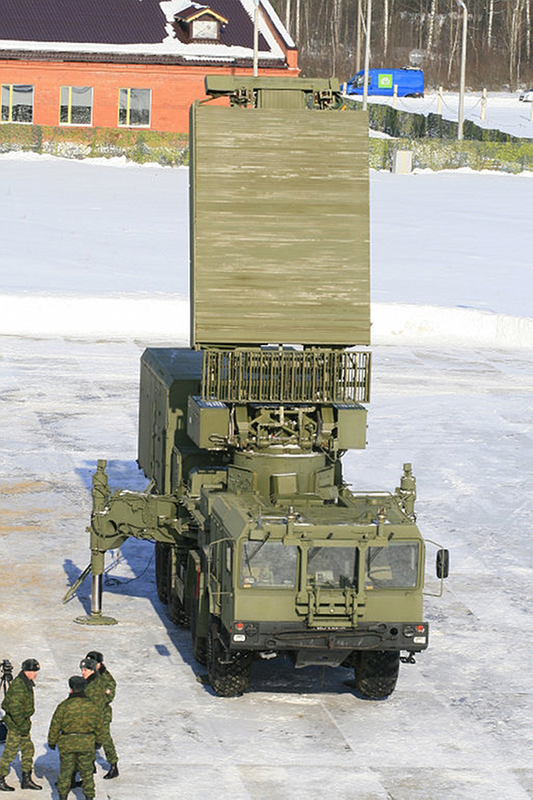 With most potential export clientele already operating legacy SAM systems such as the S-75M/SA-2 Guideline, S-125/SA-3 Goa and 3M9/9M9/SA-6 Gainful, this could prove to be an attractive marketing tool. The model claimed for the S-200/SA-5 would likely be applied, using the SNR-75 Fan Song, SNR-125 Low Blow or 1S91 Straight Flush to guide the missiles to an aimpoint produced by the 92N6E Grave Stone tracking the target, and in the latter instance, provide terminal phase illumination. 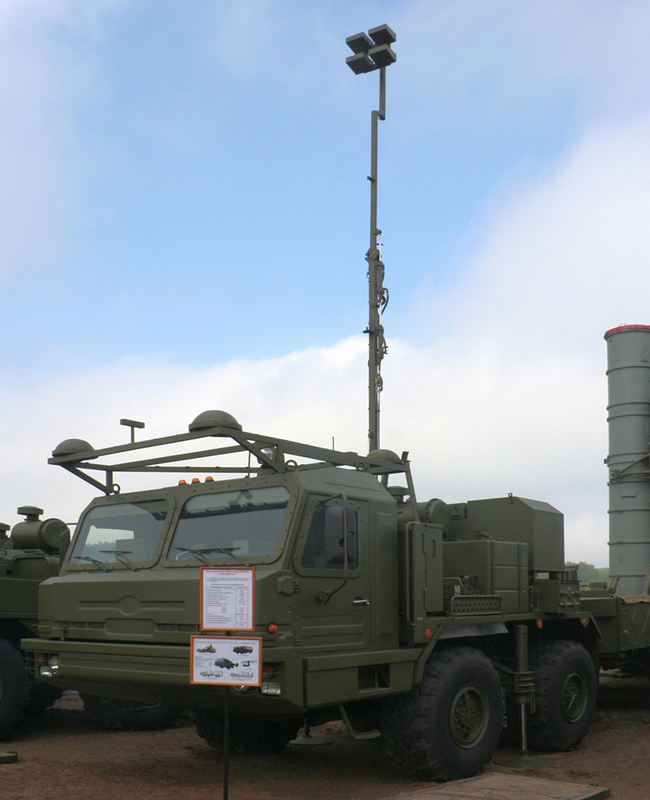 The key issue of reconciling location errors between the various system components can be addressed by satellite navigation, with dual mode GPS/Glonass receivers already widely used in Russian equipment. 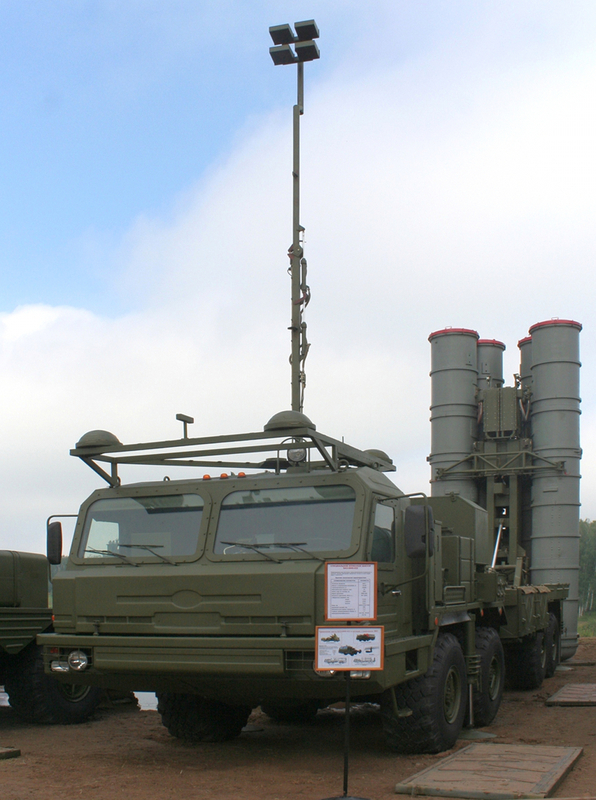 The use of the NK Orientir precision geolocation and angular alignment system in the S-300PMU2 and S-400 presents a good example. 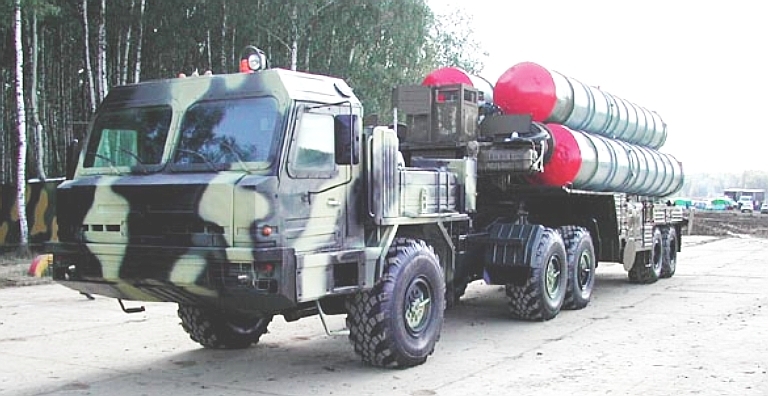 The 2008 VKO paper by Lemanskiy et al of Almaz-Antey described the capability to control a range of S-300P variant batteries, and other contemporary IADS elements, but did not elaborate on legacy SAM system integration. 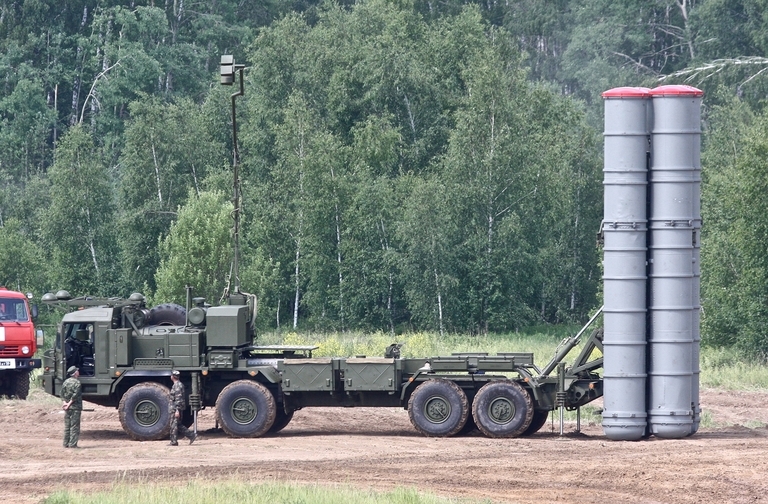 The first S-400 battery achieved IOC status during the 2007-2008 period, and further batteries were being delivered to Russian PVO units since. Russian media reports indicate delays in delivery against initially planned schedules, which is not unusual for new designs. 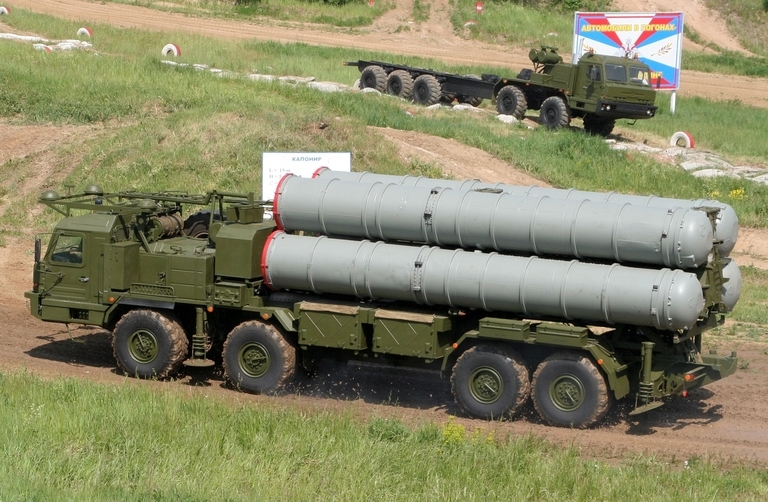 The S-400 is being actively marketed for export. 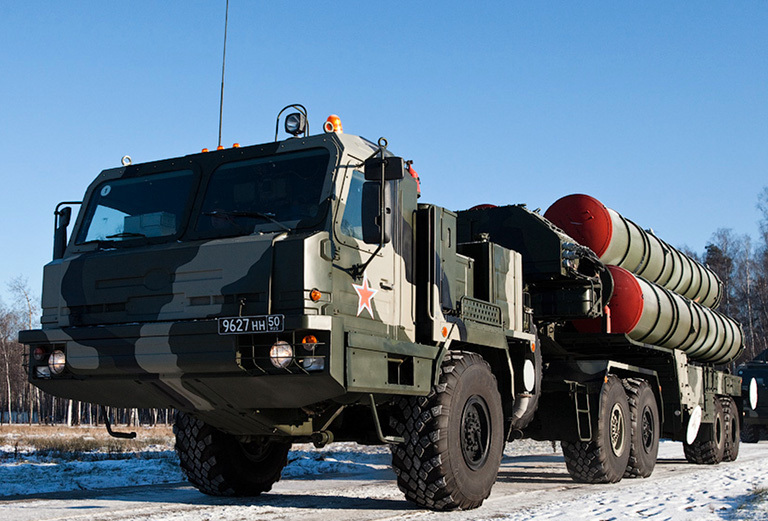 The first export client for the S-400 will be Belarus, with reports emerging early in 2009 that a delivery of multiple batteries had been negotiated. 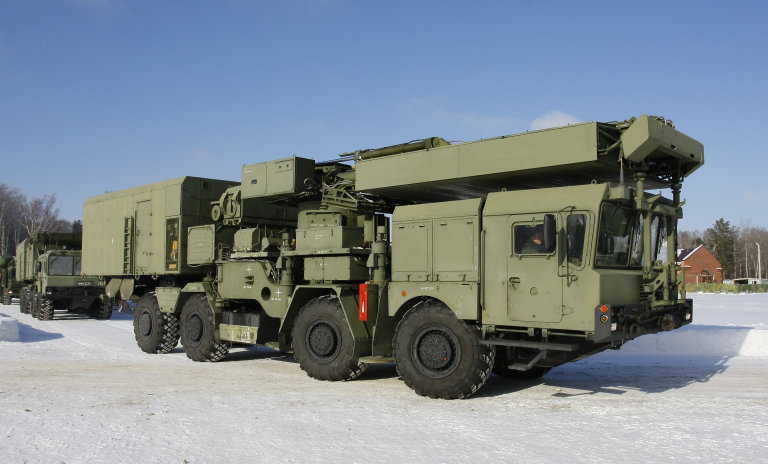 Recently claims have emerged in Russia of a follow-on derivative of the S-400 Triumf, designated the 40N6M Triumfator M, including claims that the 5P90S and 5P90TMU TELs would be used. To date there have been no formal disclosures detailing this variant. Stowed 5P90S TEL (© 2011 Vitaliy V. Kuzmin). Only one set of images has been published to date of a 5P85SM/SE2 Self Propelled TEL which was only ever a development prototype. 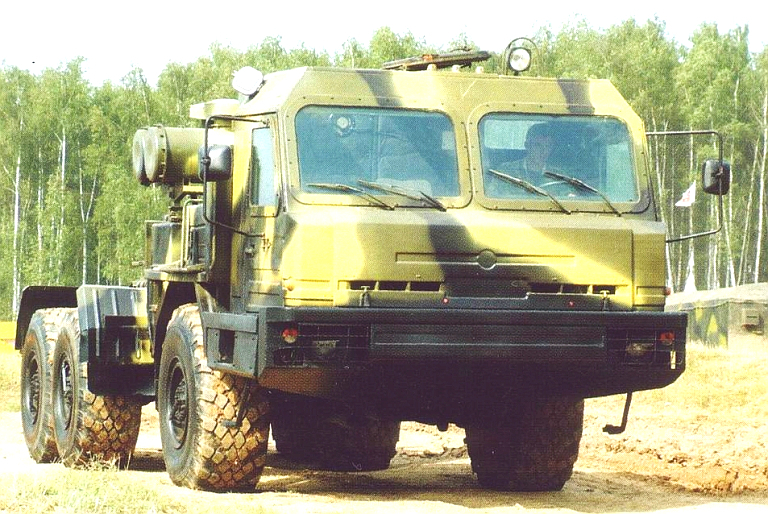 This testbed S-400 TEL is based on the 5P85SE hosted on the MAZ-7910 chassis. 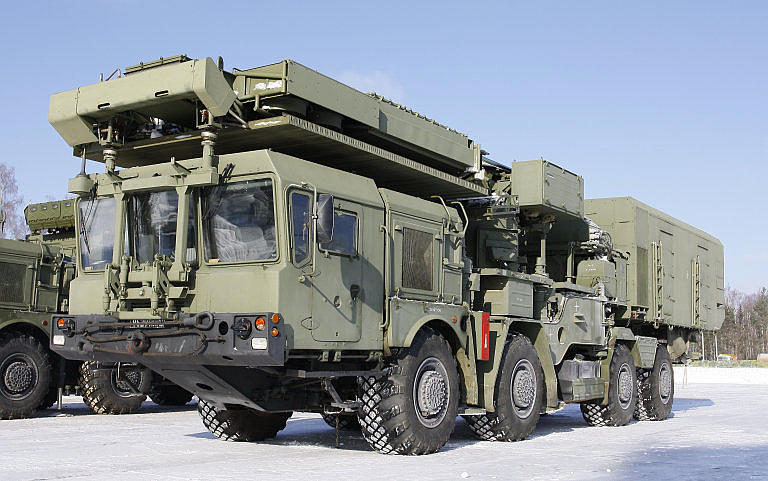 This variant is unusual in terms of using a large telescoping mast and a four element directional datalink antenna array, not currently a feature of the production 5P85TE2 TEL design used in operational S-400 units, but introduced on the later 9P90S TEL. The three to fourfold increased elevation of the segmented mast and higher gain antenna system would permit this TEL to operate at a much increased distance from the 92N6 Grave Stone engagement radar, with a minimum of datalink waveform emissions in directions other to that of the controlling Grave Stone. The antenna element type is unclear but may be an endfire variant. The mast arrangement suggests an external coaxial cable on a spool, not visible in the imagery. It is not known whether antenna boresight aiming is manual or under servo control, or whether the antenna boresight is fixed and the antenna mainlobe aimed by pointing the whole TEL. 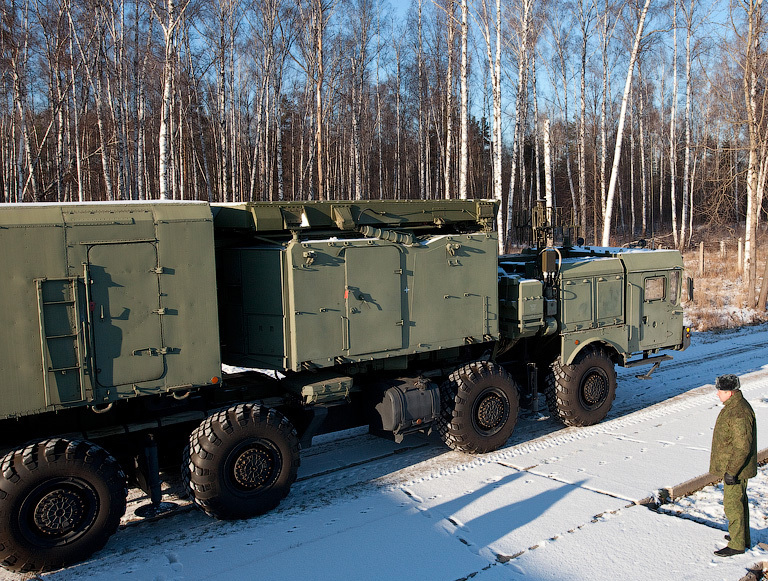 Above, below: long range datalink equipped self propelled TEL cited as part of the S-400 system (Almaz/Milparade). No Images Available. This TEL will use the same systems and gantry design employed in the 5P90S/SE self-propelled TEL. It will be towed by a 6 x 6 BAZ-64022 tractor as used with the 5P85TM. 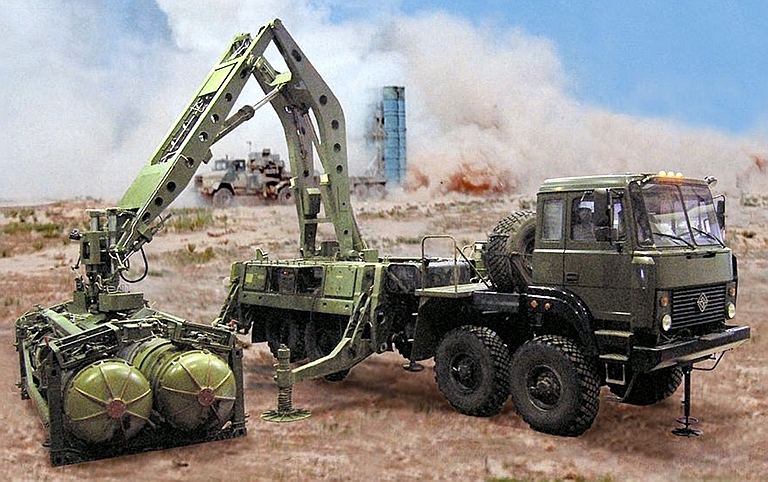 The 5P85TM/TE2 TEL towed by a 6 x 6 BAZ-64022 ,  tractor is a distinctive feature of the S-400, making it readily identifiable in comparison with the KrAZ-260 towed 5P85TE variants used with the SA-20 Gargoyle. 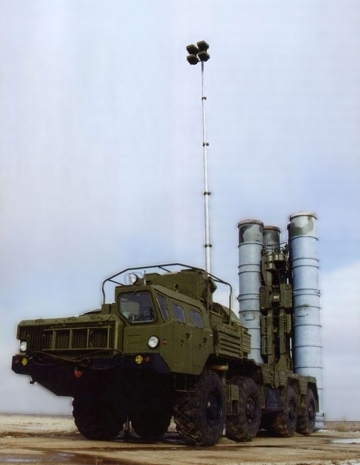 Later S-300PMU2 systems exported to China use the 5P85TE2 TEL and BAZ-64022 tractor (Almaz-Antey/Vestnik PVO). 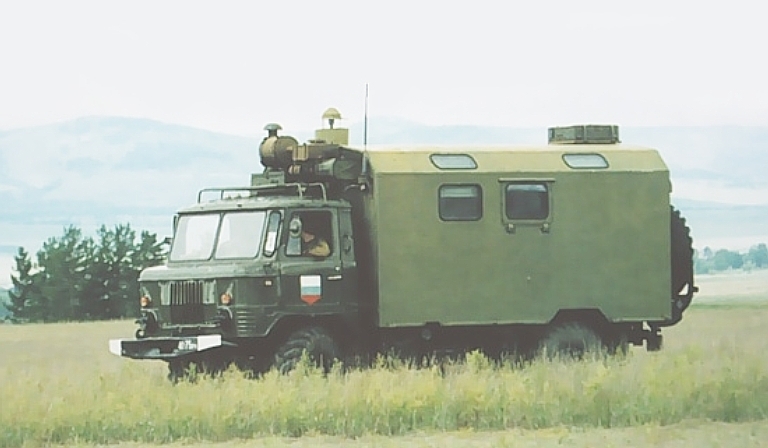 55K6E CP carried by an 8 x 8 Ural 532301 (above) truck, and operator consoles (below) in van (Almaz-Antey). 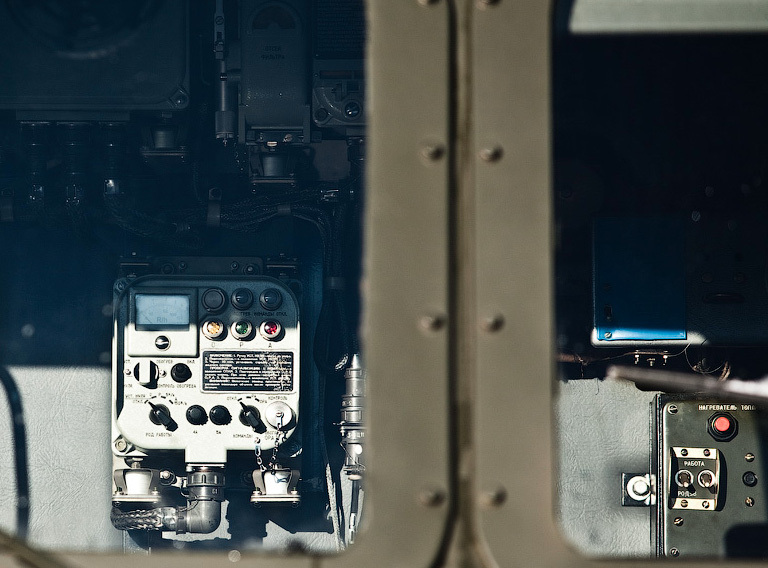 Above, below: Late production 55K6E command posts will be hosted on the 6 x 6 BAZ-69092-012 (image © 2011 Michael Jerdev). The 92N6E Grave Stone is an evolution of the 30N6 Tomb Stone / Flap Lid series, and is carried by an 8 x 8 MZKT-7930 vehicle (© 2010, Yevgeniy Yerokhin, Missiles.ru). Late production 92N6E Grave Stone systems are to be hosted on a variant of the 10 x 10 BAZ-69096 (image © 2011 Michael Jerdev). Late production 91N6E battle management radars are to be towed by the 8 x 8 BAZ-6403.01 tractor (image BZKT). 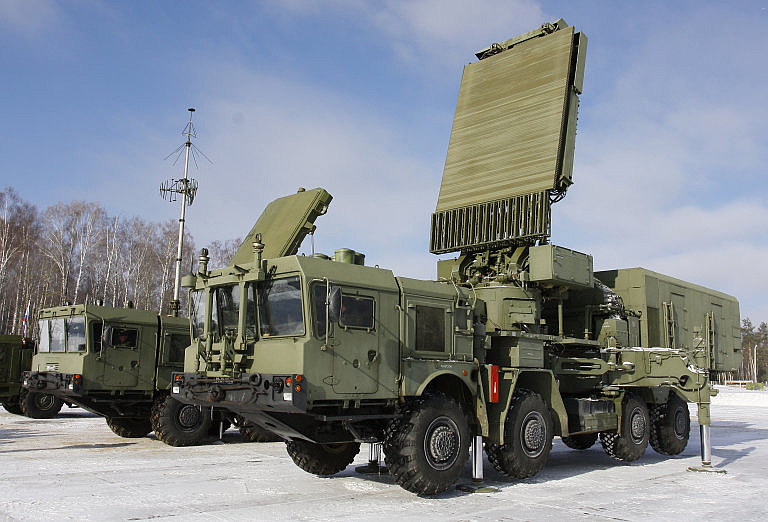 LEMZ 96L6-1 acquisition radar carried by an MZKT-7930 vehicle (© 2010, Yevgeniy Yerokhin, Missiles.ru). Late production LEMZ 96L6-1 acquisition radars are to be hosted on a variant of the 10 x 10 BAZ-69096 (image © 2011 Michael Jerdev). 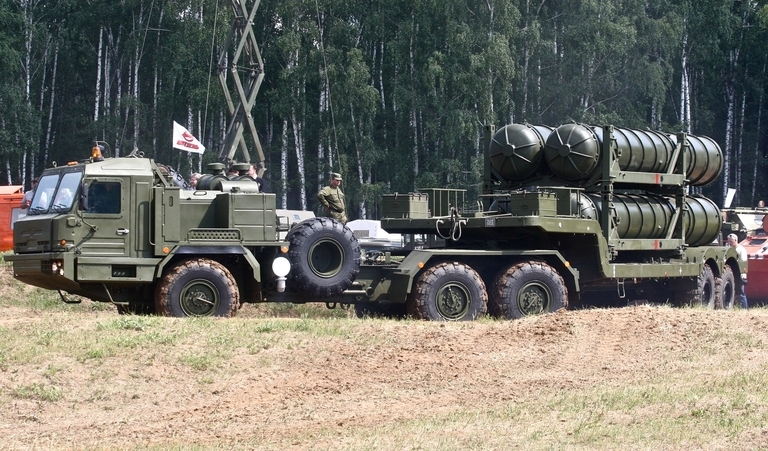 As on May, 2010, two operational PVO units were equipped with the S-400 / SA-21, with a third designated unit being equipped. 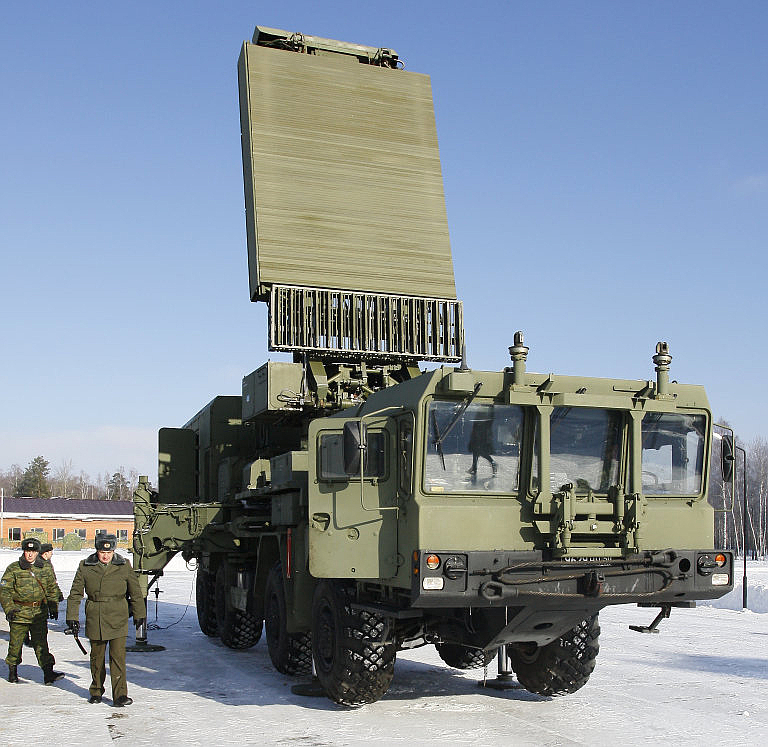 In February, 2010, Missiles.ru editor Yevgeniy Yerokhin visited the former S-25/SA-1 Guild base at Elektrostal' outside Moscow, at the invitation of the Russian MoD. 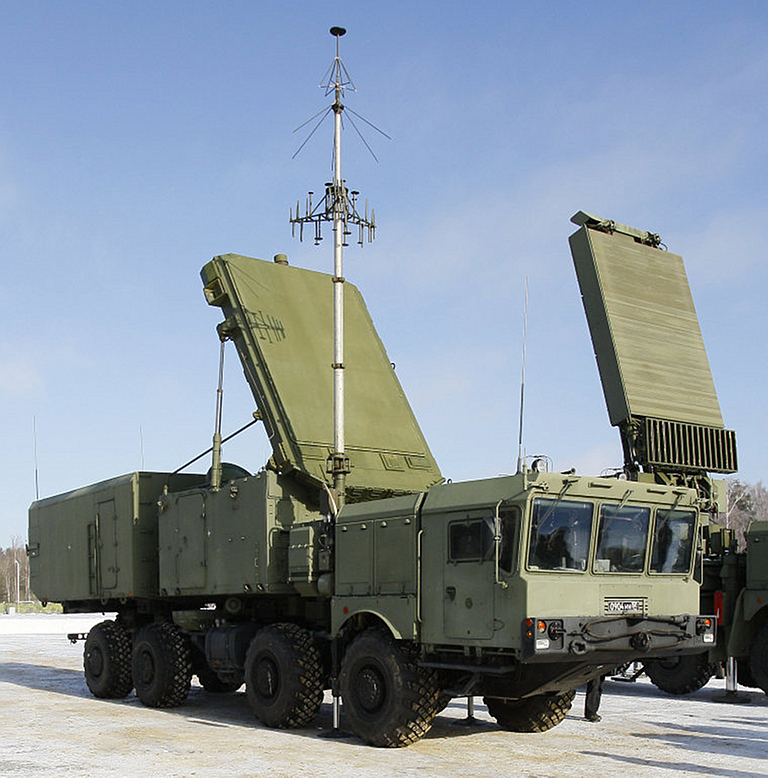 This site is now home to the 3rd Surface to Air Missile Battalion of PVO Unit 61996, equipped with early variants of the S-400 SAM system. Portions of the extensive photo-essay are reproduced with permission. All images © 2010, Yevgeniy Yerokhin, Missiles.ru. Above, below: S-400 battery components. Above, below: 92N6 Grave Stone and 96L6 radars deployed. 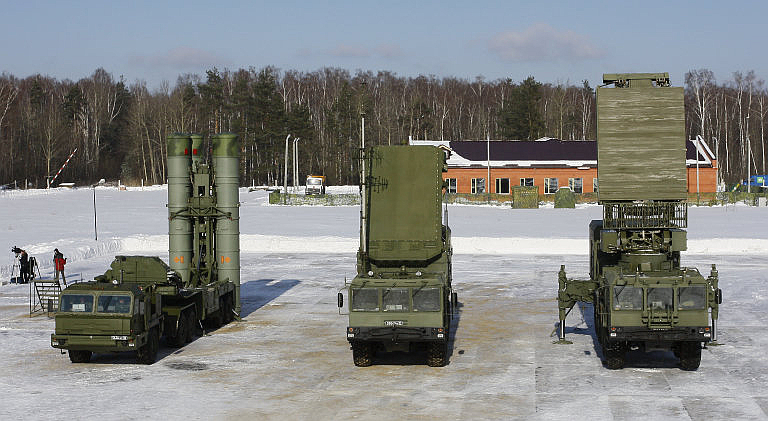 Above: new 5P85TM TEL design common to S-400 and S-300PMU2. Note the stowed datalink mast and antenna. Above, below: stowed 92N6 Grave Stone. Above, below: 96L6 acquisition radar deployed and stowed. In December, 2010, freelance photographer Leonid Varlamov visited the Elektrostal' base outside Moscow, and produced a series of high quality detail images of the 92N6 Grave Stone and 5P85TE2 TEL. Portions of the extensive photo-essay are reproduced in compliance with the terms on the author's website. Detail views of BAZ-64022 tractor in operational disruptive camouflage. 5P85TM/TE2 elevating the launch gantry. The operator on the right is monitoring the TEL status and control panel. Auxiliary Power Unit control panel exposed. TEL main status and control panel in detail. 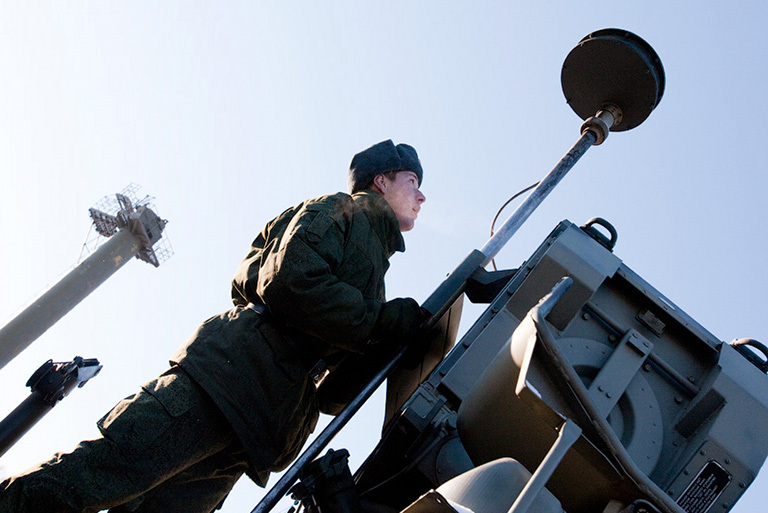 Above, below: telescoping datalink antenna, common to late variants of S-300PMU1/2 TELs. The design is clearly built to radiate with a horizontal toroidal mainlobe. 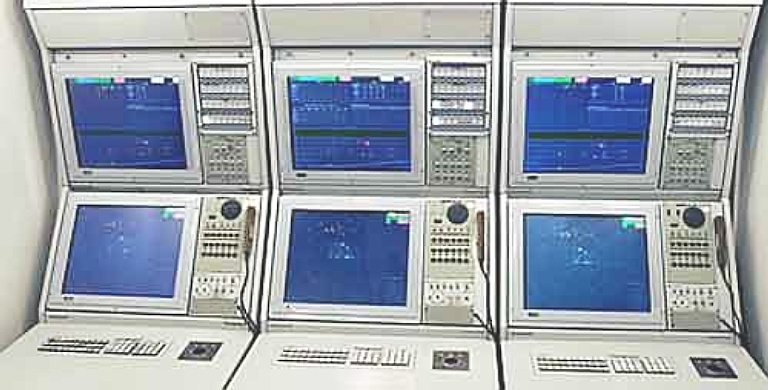 TEL status and control panels in crew cabin. 92N6E Grave Stone with space feed primary antenna deployed, and telescoping datalink mast elevated. Note the auxiliary apertures used for sidelobe cancelling and interferometry along the base of the main transmissive array. 92N6E Grave Stone driver cabin.